Leon McCarron is an adventurer, filmmaker and writer who specialises in long distance, human-powered expeditions. Over the past 8 years, Leon has travelled the world in pursuit of his passion for adventure and storytelling. 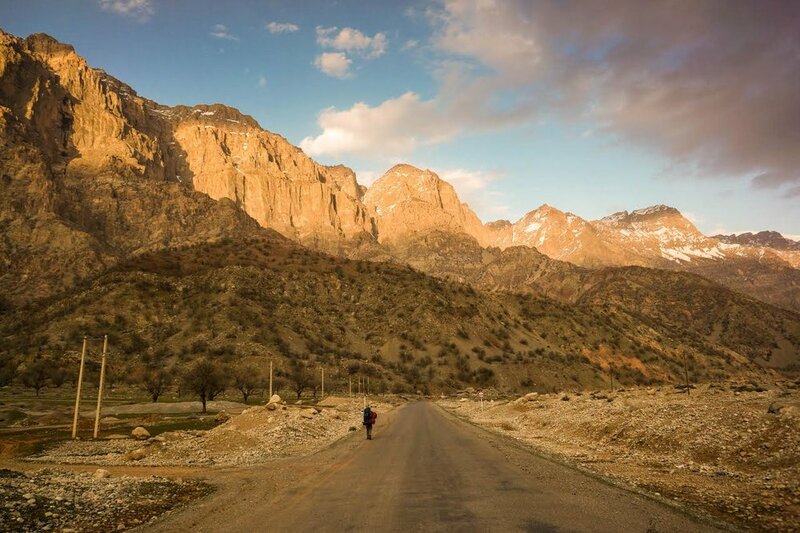 He has crossed 1000 miles of the Empty Quarter desert, walked the length of China, cycled from New York to Hong Kong, and conquered the longest river in Iran, the Karun. I spoke to Leon about how he has forged a career as an adventurer, his passion for human powered expeditions, and the benefits of going on adventures. What is the story behind your passion for adventure? I was brought up in the countryside in Northern Ireland, where it was very wild and green. I have always felt comfortable in places where I feel a connection with nature and the world around me. I felt like I lost that connection when I went to university in Kent, hanging out in fields was not very cool when I was a student. After I graduated, the job market was dismal so I thought it would be a good opportunity to go on an adventure. I decided to attempt to cycle around the world, and managed to get as far as Hong Kong before I ran out of money. The trip was two years, long enough and exciting enough that when I returned home I knew there was no way back to what I thought I was going to do with my life before I left. What inspired you to specifically want to cycle around the world? It was a distillation of what was realistic at the time and what I was interested in. I really enjoyed reading about great explorers of the Victorian era, but their expeditions always felt like something I would not be able to replicate. I did not know of anyone who did long-distance, human powered journeys and I could not afford to travel in any other way so it made sense for me to go on a cycle. I highly recommend these long expeditions for anyone but particularly at formative points in your life because, for me, it was a rite of passage journey. I was taking responsibility and ownership of my life, I was free of full time education for the first time and trying to figure out what I would like to do for the rest of my life. Rite of passage journeys are so important, especially in the modern world, where career structures don’t exist like they used to. When you returned home, how did you go about making your passion for travel and adventure your career? When I returned home after my cycle adventure I knew no one was going to pay me just to travel and, in any case, that was not what I was passionate about. It was story telling that really appealed to me, when I started writing for local newspapers about my travels and someone would respond positively to my article, I found it exciting. Shortly after I got back, I moved in with a friend who worked for National Geographic and started speaking to him about accompanying him as a cameraman on a walk across China. It sounded perfect, there was nothing keeping me at home. It took six months to plan and then we set off. I was fortunate because my friend had connections with National Geographic and we managed to get a deal for a TV series through work he had done in the past. You cannot really predict that sort of thing but I am always amazed by how many stories I hear of people doing something they are really interested in then get a lucky break along the way. Luck generally finds people if you put enough effort and time in to your passion. What is it about human powered adventure you find particularly enjoyable? The beauty of human powered adventure is that it allows you to tell the story of what is happening at a certain time in a certain place. Rob and I saw China changing before our eyes, it was 2012 when people were talking about China as a new superpower and we saw it happening, towns growing out of the ground and freeways springing up like arteries connecting a nation. The China trip was very influential for me because it was the first time I had done a long walk. I was immediately converted to walking; it is fast enough that you are not staying still but slow enough that you really see and feel what is happening around you. As a way of combining that physical and mental alchemy we look for when we go on adventures, it does not get much better than walking. We live in a world that is so segmented by international borders and boundaries, if you are travelling in a vehicle you are funnelled along roads and paths, walking allows you to get off the beaten track. What inspired your journey to the Mongolian wilderness? I always wanted to go to Mongolia, along with Patagonia, it felt like one of the world’s last great wildernesses. It was a thrilling and exciting experience trying to cross a desert from North to South. We would come across nomads in their Ger tents in the middle of this vast wilderness, they would take us in out of the cold and feed us hot milk, then we would be walking through whiteouts again, it was a crazy, wild experience. To be somewhere when you can turn around in a 360 degrees circle and see no sign of mankind is really cool, it reminds me of just how big the world is. Is part of the appeal of your expeditions, the solitude? I really value the solitude of these adventures but there is a fine line between solitude and loneliness and it is an easy line to cross. I think it is character building to experience time alone when you are completely isolated and responsible only for yourself. I wonder sometimes if I am just running away from real life, it is so nice to disappear and walk through the hills for two weeks. Have you been surprised how welcoming people have been on your travels? One of the biggest revelations I have had since travelling is that we live in a kind and hospitable world. In the era of twenty-four-hour news, the news cycle is dominated by negative stories and this can build up a culture of fear, fear of other people and fear of ‘the other’ in general. I think that is a very bad way for us to go and has been reflected in a lot of the trends in global politics right now. Going on adventures can be an antidote for that; when you are travelling by human power you are inherently vulnerable and people respond well to that. I have spent a lot of my life benefiting from that and feel it is a duty and responsibility to pass on my good experiences. When you deliver school talks what do you say are the greatest benefits of going on adventures? There are a lot of lessons learnt from going on adventures, in my own experience they have changed the way I think, life is way too short to spend forty to fifty hours a week doing something that we do not enjoy, we need to find something we are passionate about if we possibly can and combine that with something that is doing a service or something that is useful. The lessons I have learnt and try and impart to school children are along those lines. Adventure is one of the simplest ways to find these things, you get scared, you get lonely, so you should draw on reserves you did not know you have and ultimately come out the other side as a stronger person; perseverance and things that do not have meaning when they are in a bland context become clear and can help build confidence. What inspired you to write your latest book The Land Beyond? My book tells the story of walking through the Holy Land, focusing on people rather than politics. Of all the journeys I have made, it is the most enlightening; the Middle East is a really misunderstood part of our world, there is a lot of positive stuff that gets lost under the negative stories coming out of the region. I met a guy who had been involved in building hiking trails along old pilgrimage trails and trading routes. I figured I could combine these trails with other areas I wanted to go to and design this circular route that would take me through the Holy Land and go and see if it is safe to wander across the West Bank and the Sinai Peninsula, it turns out it is. I am very fond of the Middle East, there are lots of places that I feel a real affinity to there but outside of that whole region I really like Patagonia and southern parts of Argentina, it is somewhere that still has a romance.